Last year, together with Rod, John Brooks and Antonio, I visited the Spa 24 hour race in Belgium and saw the Donkervoort D8 GT for the first time. I'd heard about it on the internet previously, but when confronted with the real deal, I was amazed how good it looked. The car screamed for a closer look, and I knew I had to visit the company someday -fast forward to last Tuesday. After some email contact with Donkervoort, they invited me to come over and take some pictures of the new factory and cars. I was greeted inside the showroom by the daughter of Joop Donkervoort, the man who founded the company in 1978. After a short tour inside the factory, showing me the complete build process, they gave me all access to walk around and take photos. The photo in the opening shot shows the road going version of the D8 GT prototype -the first car with a fixed roof made by Donkervoort. Seeing the car just standing there put a big grin on my face, it just looks so menacing. 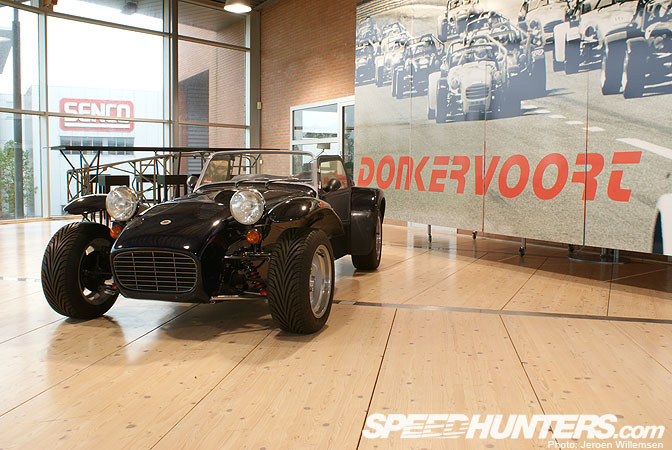 In 1978 it all started in a small shed in Tienhoven, Netherlands, where Joop Donkervoort started to build his own cars. The cars were based on the Lotus Seven with a light spaceframe and no electronic assistance aids -it's just you and the car. After the first S7 came the S8 with improved handling and a Ford 2 liter engine capable of 110bhp. This D8 270 greeted me when I entered the showroom. In the past, Donkervoort used Ford engines but in 1996 they got in contact with Audi and an agreement was made. From then on, the cars have been outfitted with the Audi 1.8 turbo engine. You can imagine that combined with the low weight of only 630kg, this car has serious potential. On the top floor of the showroom, I found this beautiful blue D8 210. The number 210 stands for the amount of horsepower. This car will go from 0 to 100km/h in about four seconds -it puts it in serious supercar territory. This car is the first Donkervoort built in partnership with Audi. 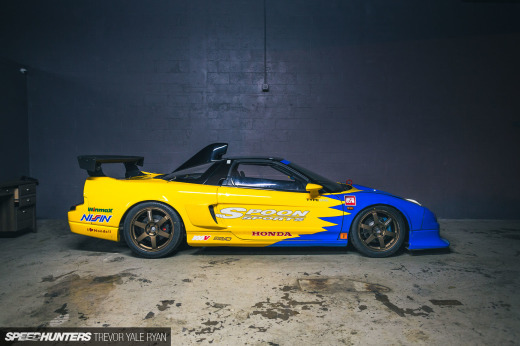 It was constructed for circuit racing and features a V6 outputting 280bhp. I can't imagine how it would feel like driving a car like this! Most of the cars you see parked up in the factory, are customer machines which have been dropped off for service and maintenance. 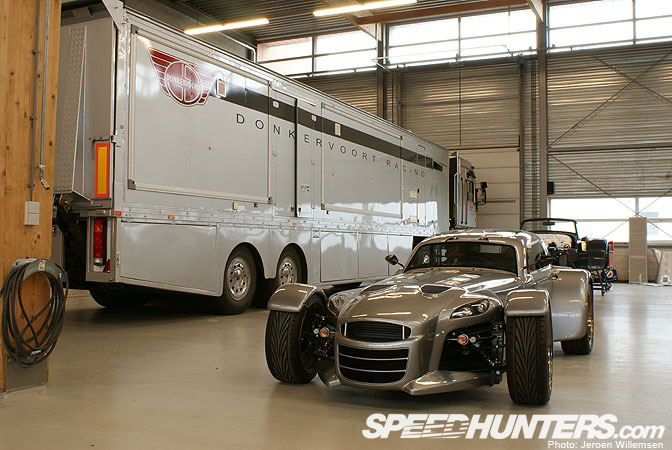 You can order your Donkervoort in every color available. I especially liked the Porsche green one although orange seems to be very popular. This D8 is a very special one because only 25 of these were built. It's called the D8 270 RS and has been constructed as a tribute. 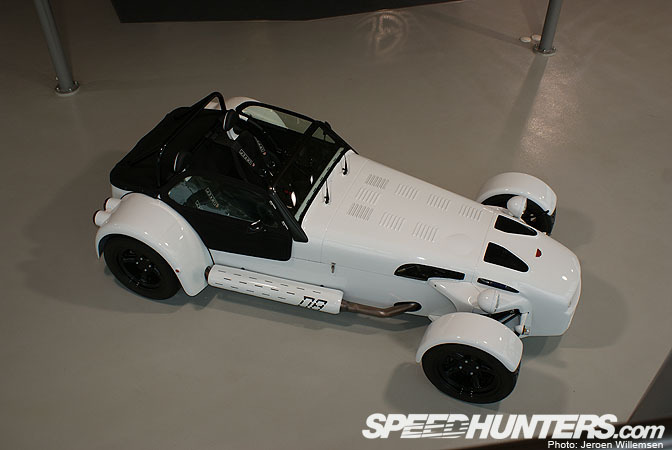 In 2004, Donkervoort went to the Nordschleife to attempt to break the production car lap record with a D8 and acheived a laptime of 7,14.89 minutes. Since 2004, that record has been broken, but Donkervoort assured me they will return and try to take it back. This tribute model has its own serial number and the name of the owner stamped on a metal plate. Other limited edition items are the bigger intercooler, a larger turbo and different fuel injection compared to the standard D8. Thanks to these modifications the power output has been set on, you guessed it, 270bhp. …The Audi 1.8 turbo engine in all its glory. 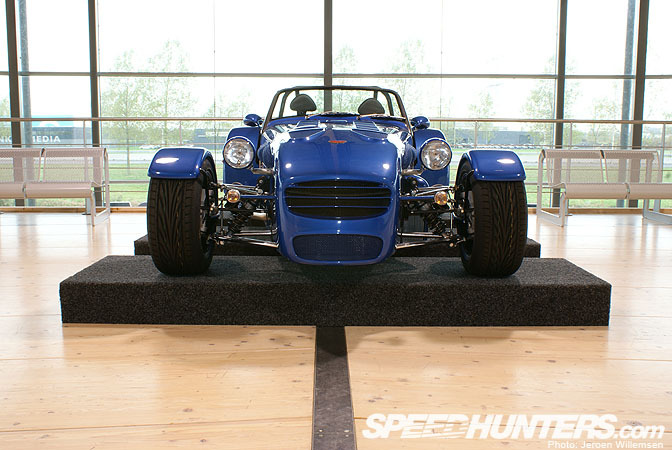 It is surrounded by a lot of carbon fiber… in fact Donkervoort is able to make the carbon themselves. Actually the engine is the only thing they need to outsource. This is one of Donkervoort's racing cars -they have three of them that race in the FIA GT4 European Cup. The cars are exactly the same as the road going version except for the rollcage and a slightly bigger power output. This graphite gray version really caught my eye. The cars just got back from a race on Zandvoort hence the worn rubber. I think that the rear is the most striking part of the newly designed D8 version. The entire canopy has been made from carbon. This closed version only adds 30kg to the total weight compared to the open top D8, that's quite a achievement if you'd ask me. The exhaust exit just under the rear light is a very cool touch. I thought it was very cool to see these Rays Engineering RE30 wheels on this Dutch product. They weigh 6kg and come in size 17"x8 all around. 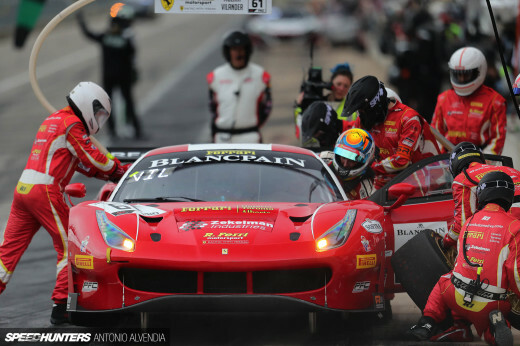 Behind them we see Tarox brakes with six piston calipers. 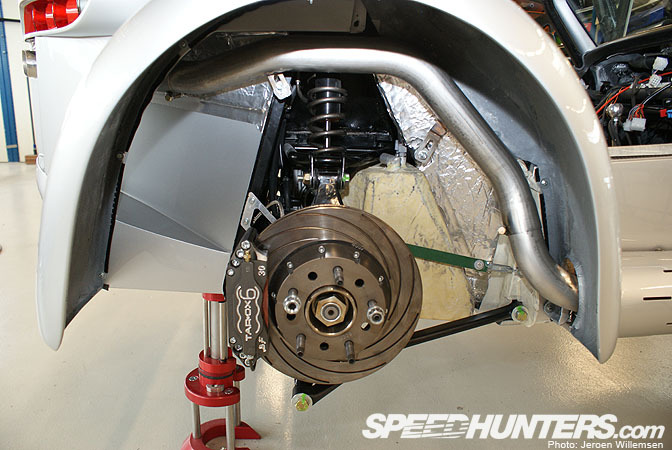 Here we see how the exhaust runs inside the wheel well. It has to run like this because there's no room underneath the car. This D8 was a work in progress for the 24 hours of Dubai that will be held in January. After walking inside the factory, I have a renewed respect for Donkervoort. It's a Dutch company that started in a shed and has grown from a dream to reality. The cars they build are raw and pure but still give the feeling of control. I wanted to thank Amber Donkervoort and Joop Donkervoort for their hospitality. Pic 10/11, so so hot. Awesome post. Wow, those are certainly some incredible custom rides! The Donkervoorts look like they would be a blast to drive! For sure... this gives readers across the globe a new meaning to going Dutch! 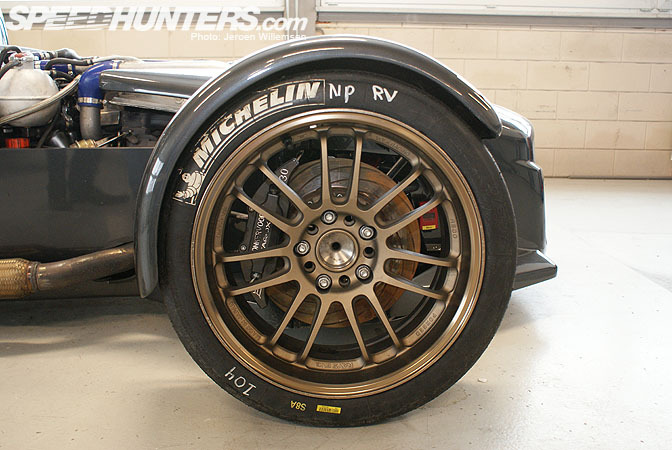 Yes, Donkervoort; Hollands Premier Sportscar Manufacturer. PERIOD! never seen a car like this besides the prowler or whatever chrysler made but this is way to cool to be an american car. Neat little cars, but still think I'd prefer the real Lotus Seven's or Caterham's. This just seems like yet another knockoff of the Seven with their own bit of fab work, is there something special about it? Insert Netherlands/hemp seats joke here. I would love to know how one of these would stack up against a Caterham. i would LOVE to have a hard-top version like that graphite gray one you were talking about.. SIKK! Wow the gray racing version looks crazy. 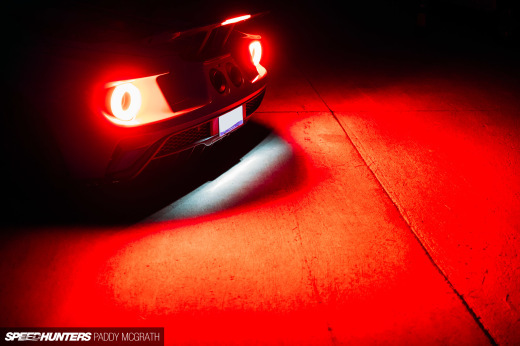 Awesome cars. to be honest the caterham is better with their r300 and r400 and csr260. But donkervoort dare taking the lightweight car route a different direction as it shows with the d8 gt and gt4. But i'd stilol have a caterham or westfield.No offence dutch people. What about the temps in that wheel well? Doesn't the tire get some abuse because of it? excellent article. Thanks for the ORIGINAL content! Looks like a very cool shop. They wouln't let you test drive one? why the long hood? look at those intercooler pipes, looks like turbo lag to me. and why not just dump the exhaust out the side in front of the back wheel instead of making all those inefficient bends in the wheelwell?!?! I saw Donkervoort driven by Joop Donkervoort on the Brno circuit (Czech republic) - very sympathetic man and impressive and fast cars.Huge xperience. oh jesus what's the offset on those RE30s??? Google or wiki 2 things, Lotus 7 and Lowcost or Stalker. They started British, but there is now a British, French and Dutch version of the Car. Of course there is also the US version aka Lowcost or Stalker. which are also based on the Lotus 7. The name fools you, but the cars are certainly not to laugh at. They look very nice, must be awesome on the track. Great post. surely they don't MAKE their own carbon fiber... Just the CF parts!